Before moving to Chapel Hill six years ago, my family spent ten years in Denver. Although it was easy to leave the long winters behind, it wasn’t so easy to leave good friends, including a wonderful community of writers. One of those writers was Caroline Stutson, a picture book author and poet who passed away two years ago. 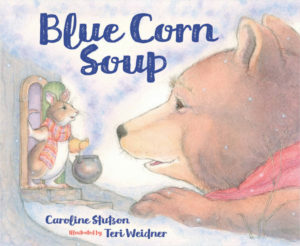 Sleeping Bear Press just published her book Blue Corn Soup, a story Caroline had shared with me years ago. I know she’d be so pleased to see it in print, with Teri Weidner’s warm and cozy illustrations, and to know it’s being read aloud and shared. To encourage that sharing, I’m giving away a copy here (details below). Caroline joked that she had rhymer’s disease (an affliction many of us share), but that was a disservice to her talent. Caroline was a fine poet, with an exquisite ear for language and rhythm. Caroline was an experienced storyteller and puppeteer, and she had a storyteller’s gift for language, pacing and repetition. 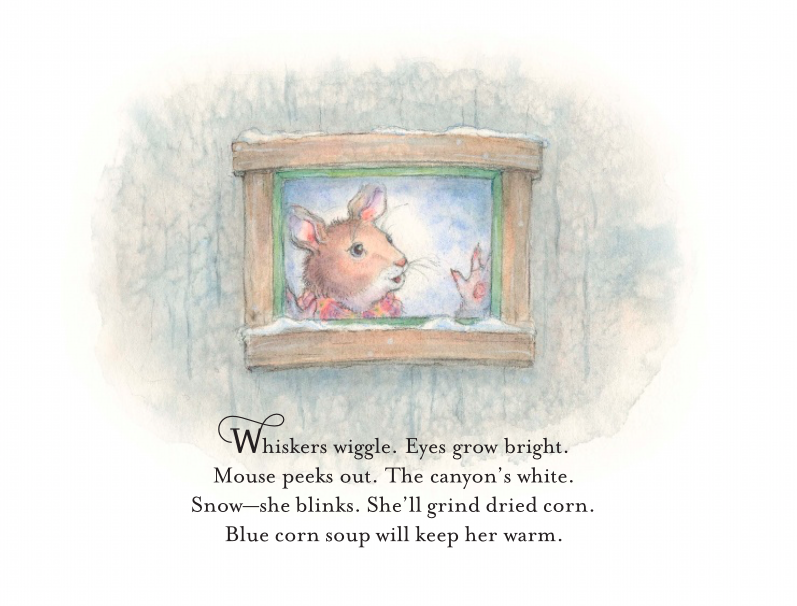 In Blue Corn Soup, she uses all three skillfully, repeating patterns and an important question (“Something’s missing. What—is—it?”) to move the story forward. 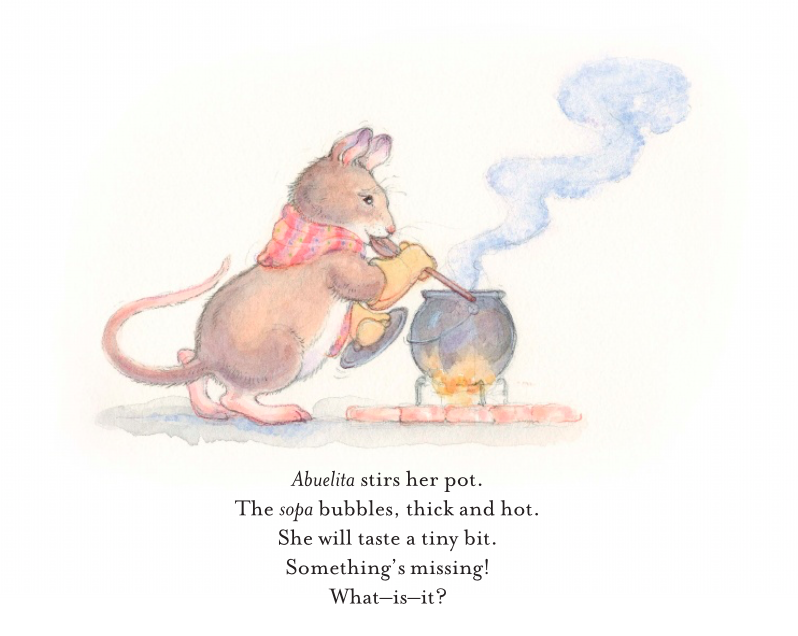 She goes back and forth between indoor scenes of Mouse adding new ingredients to her soup . . .
to outdoor scenes of the animals intrigued by the tasty aromas. Pinon smoke drifts through the wood. Is it sopa? He’ll find out. Caroline uses the same pattern to introduce us to Rabbit and Old Bear, and then again as the three follow their snouts to Abuelita’s house. “Wait!” Mouse follows. “We can share. Sip their stew, and ask for more. Food tastes best with company. It’s a just-right ending to a warm and satisfying book, perfect for sharing on a blustery day. So much of the reading we do these days feels ephemeral, scrolling by on screens one moment then disappearing into the ether the next. That’s one reason I love books so much—they may not last forever, but they feel solid and enduring. Holding this book in my hands and reading Caroline’s words feels a bit like visiting with an old friend. 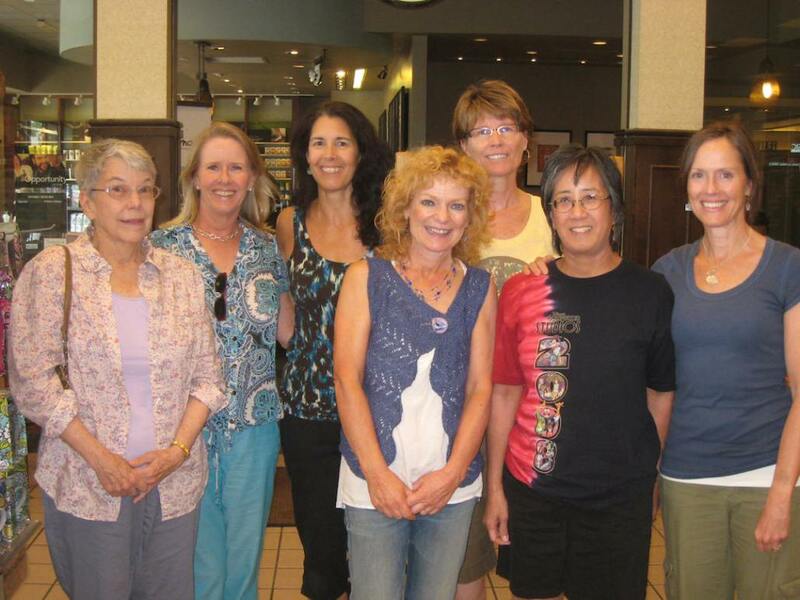 From left: Caroline Stutson, Marjorie Blain Parker, Denise Vega, Kathleen Pelley, Julie Danneberg, and Christine Liu-Perkins. I’m not sure what happened to Jessica Swaim, but she should be here too. These are some talented women. If you’re not familiar with their books, be sure to check them out. By the way, Blue Corn Soup ends with a recipe. Our good friend Jama Rattigan cooked up a batch over at Jama’s Alphabet Soup, and it looks delicious. For the chance to win a copy of Blue Corn Soup, leave a comment below. I’ll announce the randomly-selected winner in my next post. And, finally, Suzanne Slade asked me to announce the winners from her Feb. 27th Astronaut Annie post. Winners, please contact Suzanne via her website to provide your addresses so she can mail out the books. Congratulations! 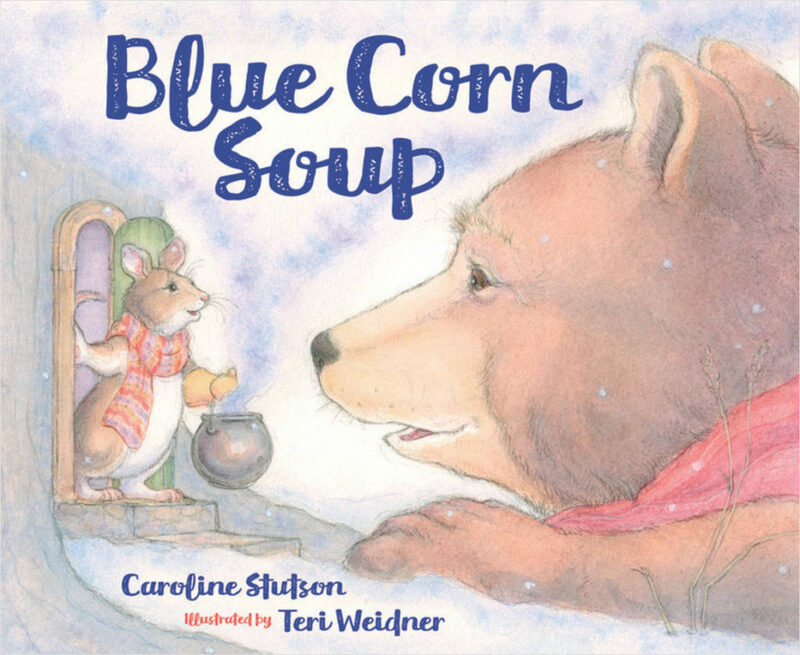 Blue Corn Soup, Caroline Stutson, Linda Ashman, sleeping bear press, Teri Weidner. Bookmark. This looks like a beautiful book….such soft words and illustrations. Thanks for the opportunity to win it! Yes, Joan, it’s the perfect read (and recipe) for a cold winter day! What a beautiful story- both the tribute to your friend & Blue Corn Soup. Beautifully written and illustrated. Love the cadence! What a lovely book. Warm and cozy is just right! Goodness what a sweet-smelling book! I can wait to taste! What a wonderful post. Thanks for sharing! It’s a lovely book. Thanks, Lynne Marie! Sounds lovely and such soft warm pictures that looks so inviting. Wonderful blog post! Love the peek you’ve given us of this book and I really look forward to reading it! I think you’ll enjoy it, Kim! This book could become a friend to share. The rhythm and pictures are sweet. Such a sweet book! I look forward to reading it! I think you’ll enjoy it, Tracy! An endearing story of friendship. Looking forward to reading this one! It IS endearing, Judy! I think you’ll enjoy it. This book looks so adorable! I’m happy that it was published. It will be perfect for winter reading and talking about friends! Thanks for sharing this story with us! Thanks for reading, Angie. It IS adorable! Sounds like a cute and friendly story. I am sorry for the loss of your friend. I have been in your place in that regard. It’s always nice to have a book created by a friend who is no longer with us. May reading her words keep her close. Thanks so much, Kathy. It was such a sweet surprise to see this book in print. The children love her book “Night Train”, can’t wait to see this one too. Caroline was such a talented writer. CATS’ NIGHT OUT is wonderful too. Thanks, Janet! It looks like a wonderful book. Look forward to checking it out. I think you’ll enjoy it Rachel! What a wonderful way to honor a friend by sharing her words, Linda. Lovely! Thanks so much for reading, C.L.! Looks like a very sweet story! This looks like a delightful book. Such wonderful language and exquisite illustrations. What a sweet book. I can’t wait to read it. I think you’ll enjoy it, Linda! Hello, Marjorie!! So nice to see you here. I miss you all! As for winters, they probably ARE a breeze for you given your Canadian origins–you have a different sense of winter than the average human! Hope all’s well in CO! Oh, I love this book! So sorry to hear the author is no longer with us. She was so talented. Yes, she really was, Lauri. Thanks for reading! This looks like a perfectly charming book. I do love rhymers. Thanks for the post. I think you’ll really enjoy this, Rosi! Wonderfull that her work lives on for kids! Thanks for sharing this darling book! I agree, Beth. Thanks for reading! Sounds like a super-sweet tale! It is, Felicia! Thanks for reading! This looks like a wet book! I’ll be sure to check it out. I think you’ll enjoy it, Heather! Thank you for sharing this book with us today. I love the illustrations and message of this book. The writing is superb and I want to reread it over and over to help my own skills. Yes, the writing IS superb. Thanks for reading, Danielle! Sounds like a great book – I can’t wait to read it. I think you’ll enjoy it Debra. Thanks for reading! Thanks, Maria. I know Caroline would be so pleased to know her book is being read and enjoyed. I love when rhyme is done as well as it is in this book. And I’m sorry to hear about the author’s passing. Yes, Caroline was a wonderful poet. Thanks, Kathy! Thank you for sharing this book with us! It has such beautiful language and illustrations. I look forward to reading this. I think you’ll enjoy it Becky! Oh, I’d love to use the recipe….right now….as it’s pouring rain here and so cold…nothing would taste better than hot home-made soup shared with family and friends tonight. Thank you for a lovely book – warm and comforting!! I know what you mean, Judith. It’s been wet and cold here as well–perfect soup weather! And the recipe looks very tasty indeed. Thanks, Jill. I know you’d appreciate the rhyme. Caroline was meticulous with her verse (like you!). I love rhyming stories, and this one sounds like a good one. It is, Cindy. I think you’ll enjoy it! Oh, Linda. Thank you so much for sharing Caroline’s beautiful story with everyone. I miss her every day and know she would have been so happy to see this book in print, along with My Family Four Floors Up, which was published in January. I’m looking forward to singing her praises at an event in April where we will be including her books. Lots of love. And MISS YOU, GIRL! Hi, Denise! So happy to hear about the April event. I do think Caroline would be so pleased to know her books are being read and loved. I haven’t seen MY FAMILY FOUR FLOORS UP yet, but am eager to. Lots of love to you too, my beautiful and talented friend!! What a lovely post. Thank aid for sharing! I love the title. Wow. This looks great! Sure wish I could win this to read to my granddaughters! Thanks for the chance. P.S. I live close to Denver and am a wannabe writer! Hi, Sharon. Thanks for reading! Caroline’s books are wonderful to learn from if you write in rhyme. Good luck with your writing! I can almost smell the soup! This sounds like a great book. Thanks for sharing and sorry for your loss. A true poet. Such a warm and fuzzy book. Oh how I wish I could be affected by a good case of rhymer’s disease! I am sorry for the loss of a good friend. Sounds like your friend loved being surrounded by friends. She understood that this was the real purpose of life.. her spirit lives on in mouse’s story. Such a sweet central message about being a friend and having it all when in good company. Lovely story- message, and cadence! Yes, I agree, Jessica. Thanks so much for reading. Thanks for sharing Blue Corn Soup. I see what you mean about her many storyteller’s gifts. The bits you shared we delightful. I look forward to reading this book. And I’m sorry that you lost a friend. Thanks so much, Penny. I think you’d really enjoy her books. Thank you for introducing me to a delightful book, BLUE CORN SOUP, Linda. This post is such a wonderful tribute to your friend, Caroline Stutson. Thanks so much for reading, Suzy! This looks like a beautiful book. Thanks for sharing! I, too, have the rhyming affliction. I would love to read Caroline’s book. What a nice tribute to your friend, Linda. Thanks so much, Mary. And if you’ve got the rhyming affliction, I think you’ll enjoy Caroline’s wonderful books! this book looks / sounds darling! I love the soft illustrations in this book. It looks like such an amazing story. Thank you for sharing. A wonderful post and a beautiful book. Thank you for suggesting it and I’m sorry for the loss of your friend. Blue Corn Soup looks beautiful. The illustrations are adorable and that “rhyming affliction” is spot on. Perfect rhythm. Sounds like a nice story. I can’t wait to read it. Yep to all. Thanks for reading, Linda! I can’t wait to read this one! I love the soft, whimsical illustrations. Yes, they’re really charming and a great match for the text. Thanks, Stacy! The lasting bonds of friendship shine through this touching tribute, Linda. Thank you for sharing. I will be watching for Caroline’s book.